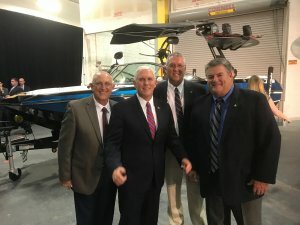 Vice President Mike Pence, Florida Gov. Rick Scott and Secretary of Agriculture Sonny Purdue visited Orlando on Nov. 2 for a roundtable discussion on tax relief. FFB State Director Mark Byrd had the opportunity to participate in the discussion and represent farm families and small business owners on the much needed tax relief. FFB members Christian Spinosa and Bill Lennon were also present. If enacted, the Tax Cuts and Jobs Act would repeal the federal estate tax within six years. This “death tax” cripples farm and ranch operations and hurts rural communities and businesses that agriculture supports. “The death tax interrupts the ability for families to pass along resources and assets to the next generation in ways that ensure the stability and vitality of communities,” said Pence. The discussion took place at Correct Craft, an Orlando boat manufacturing company. To listen to audio remarks, visit https://www.whitehouse.gov/live/vice-president-pence-delivers-remarks-tax-reform (timecode for President Hoblick begins at 15:38).